Wrong! Time gets away from the best of us. Hopefully some of these simple hints & tips will help you as they've helped me! Do you have high expectations for your home’s cleanliness and hygiene? It’s easy enough to outsource the cleaning of a workplace to professionals like AMC Cleaning (check out their website for more information). But when it comes to our own homes, too few funds or a surplus of pride can prevent us from seeking professional help. Fortunately, making your house look like it’s been cleaned by experts isn’t that difficult. You just need to know a couple of their tricks. 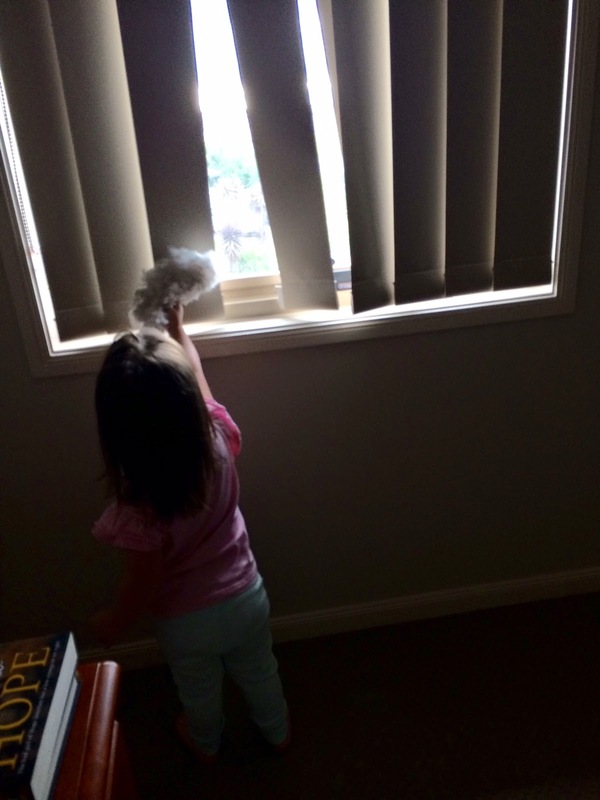 Dusting is the best place to start every time you want to clean your home. Why? Firstly, it gives you the chance to put things away, making rooms instantly tidier. Secondly, any particles that fall to the floor can simply be vacuumed up later on. Make sure you do a thorough job by moving items to properly clean underneath and around them. Be sure to also dust items that are permanently out on tables, entertainment units, and other exposed surfaces. Pay attention to skirting boards, cornices and architraves, as well as window ledges, doorways and light switch plates. Georgia likes to help her mama with the dusting.. clever girl! The most important aspect of cleaning any bathroom is taking care of the glass surfaces. If mirrors and/or shower screens are streaked in any way, it instantly makes the room look unclean. Foam glass cleaners are an excellent way to clean glass without the streaks, or you can opt for the old-fashioned and environmentally safe method of vinegar and bi-carb soda. If you have a lot of built up soap scum on shower screens, try using an ultra fine piece of steel wool (you can get this from the paint section at your local hardware store) and gently scrub in circular motions. The simple mechanical action of this method easily outperforms harsh chemical treatments in most situations. When it comes to cleaning showers, baths and basins, be sure to clean thoroughly around the bases of tapware and the drains. Ensure shower screen handles and frames are also spotless. With baths, ensure the sides and top are given just as much attention as the base. For toilets, it’s not just the bowl that needs cleaning but the lid and top and bottom of the seat as well. Clean around the seat fasteners as they are often overlooked. Clean the entire base, front and back, making sure you get right behind the pan to wipe away all dust and dirt. Lastly, clean the floors, wipe down any marks on walls and doors, and dust window ledges, light fittings and extractor fans. Like dusting, the most important thing with vacuuming is to be thorough. This includes doing areas such as the inside of cupboards, doorways to outside areas (particularly the garage), lampshades and the one place most people avoid: under furniture. You don’t have to do this every time you vacuum, but aim to do it every three to four months. Doing a thorough job with vacuuming is important as you should always mop straight afterwards and you don’t want to be dealing with loose particles when you’re doing this. Trying her best to vaccuum - it's just a little bit heavy for her! Be sure to always mop your way out of a room to avoid walking over the wet area and creating footprints that are visible once the water dries. Like with vacuuming, do your best to get underneath furniture. Kitchens are a veritable magnet for handprints, particularly if you have little ones. Start by cleaning large surfaces such as the fridge, dishwasher, oven door, cupboard doors and benchtops. If you have stainless steel goods, make sure you check your instruction manuals first as some surfaces have a protective coating that can be damaged by cleaning products. Next, work your way around all the appliances on your benchtops. To be really thorough, clean inside and underneath the microwave and conventional ovens. Wipe down range-hoods and extractor fans as well as the entire surface area of any bins. If you’re aiming for a squeaky clean house, just take a leaf out of the pros’ book by applying some of the tips above. Your home will look sparkly and be more hygienic than ever before. She also likes to help her daddy with the outside chores. This sponsored post is in collaboration with AMC Commercial Cleaning - all images are my own. If you are interested in a product review or sponsored post content appearing on Breathe Gently, please email me. This entry was posted on 10:35 and is filed under Sponsored Post . You can follow any responses to this entry through the RSS 2.0 feed. You can leave a response, or trackback from your own site.